While both My Hundred Days of War and Malcolm MacPhail’s Great War are works of fiction, most of the events – certainly the important ones – did take place, pretty much as described. The times and places are as accurate as I could make them. However, even for Frenchmen or Belgians – in whose countries most of the action in World War One takes place – few will know the villages, rivers, hills and woods that during the Great War so often assumed an importance far overshadowing their own typically modest presence. Writing the books I found maps were invaluable in understanding both the broad sweep of the war as well as how, and why, individual battles developed as they did. I expect the same will be true for readers. The following maps come from Malcolm’s hand, beginning first with the Western Front as it was in late 1917, and following the progression of the war into 1918. They are in chronological order. SPOILER WARNING: the maps do to tend to give away some of the story of the books, so it’s probably best to consult them afterwards or, at the very least, whilst reading. The Western Front in the fall of 1917 ran from the Belgian coast, with a noticeable bulge around the city of Ypres – the infamous Ypres Salient – down through France, all the way to the Swiss border. It was a line that shifted remarkably little during the war, testament to the new form of warfare that had emerged, and for which the Great War will always be infamous: trench warfare. The systems of deeply fortified trenches that emerged soon after the German breakthrough in 1914 transformed the war into a de facto stalemate, which many great battles did little to alter. It wouldn’t be until 1918, and the massive German spring offensives, that these lines began to shift. Even then, the momentum of the attackers was ground down in the space of a couple of months. Beginning with the astonishing Allied victory at Amiens in the summer of 1918, these lines began to shift for good. And when they did, it took only an astonishing three months before the war was over. 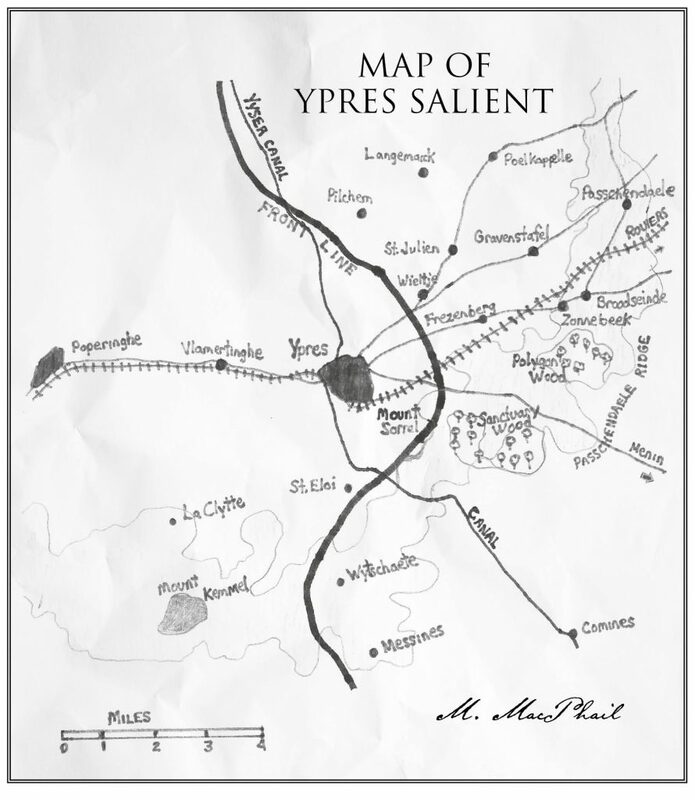 The Ypres Salient, so named for the bulge in the Western Front around the Belgian city of Ypres, has become rightly infamous. No less than five major battles occurred there. Almost every hamlet, wood and rise has a story to tell. Ypres, the last Belgian city in Allied hands, was positioned only a relatively short distance from the crucial Channel ports of Dunkirk and Calais. It assumed an importance almost unique in the war. On the map can be seen the crucial ridge line that curved around Ypres and that was the bastion of German defences prior to the Battle of Passchendaele. On its far slopes were arrayed the guns of the Fourth Imperial Army which shelled the city into a graveyard of stone. 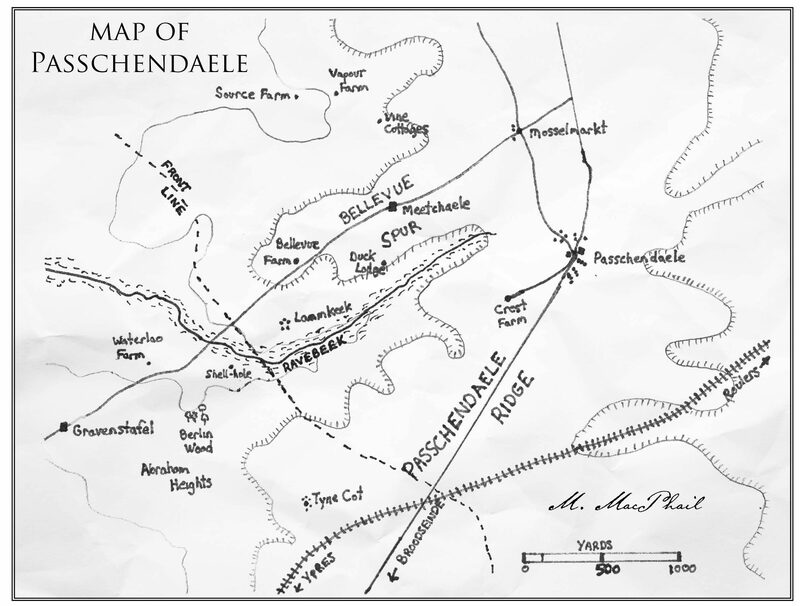 Passchendaele, as can be seen on this map, lies in a strong defensive position with its commanding heights jutting out ahead, and swampland occupying its approaches. Ahead, and to the left of the village, is the Bellevue Spur which protrudes from the main ridge line. 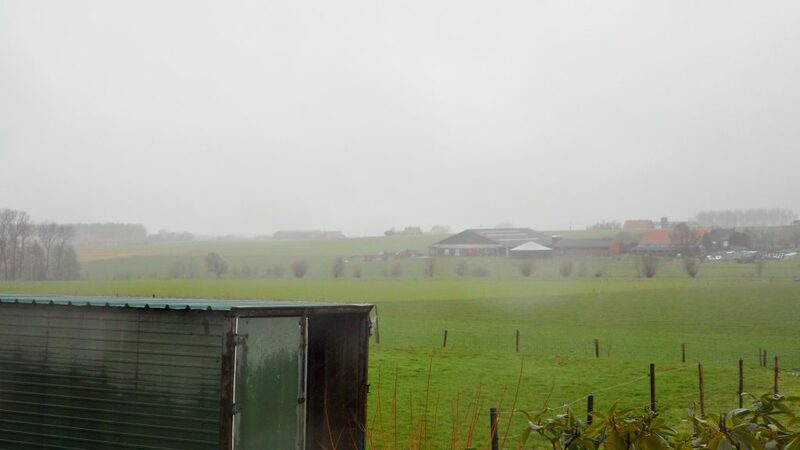 This is where the New Zealand Division was shattered (the blackest day in New Zealand history), and where thousands of Canadians (Malcolm’s 3rd Division amongst them), were killed or wounded going up against its reams of barbed wire, concrete pillboxes, and concealed machine-gun nests. To the right of the Bellevue Spur, is the valley of the Ravebeek, the small creek whose flooded banks made it impossible to traverse. Further to the right is the main ridge line. It was on those slopes that thousands more Australians, and later Canadians, became the casualties of war. But it was along that path, past the strong-point at Crest Farm (today a monument) that Passchendaele was eventually taken. On the map can be seen the shell-hole from which Malcolm and a handful of New Zealanders reconnoitered the defences of the Bellevue Spur. A mere 1,000 yards to the south, Tyne Cot is visible. When Malcolm arrived here in October 1917 its pill-boxes had just been taken by the 3rd Australian Division. Today it is the single largest Commonwealth cemetery in the world. This is my own photo, taken roughly a hundred years after the events themselves, showing the Bellevue Spur as it looks today (now vibrant greens, then a brown cratered mound). Atop the Spur runs the Mosselmarkt road. The viewpoint is from the main ridgeline – what the German defenders would have seen – looking across the small, barely visible valley of the Ravebeek. It is taken from Crest Farm, the concentration of machine-gun nests on the approaches to Passchendaele (itself only a five minute walk down the road from the village). It’s truly astonishing to think that what appears as a modest, peaceful hillock was the scene of such long and desperate fighting. The map of the Kaiserschlacht (the Kaiser’s Battle) shows the deep inroads made by the German spring offensives, beginning in March 1918. There were four main offensives, and each made large concaves in the Allied lines, particularly the first on the old battlefield of the Somme. Each offensive, in turn, foundered after a combination of stiffening Allied resistance, mounting German losses and stretched supply lines made further progress impossible. To the north (along the coast where Belgian forces held the front) swampy ground precluded an attack. 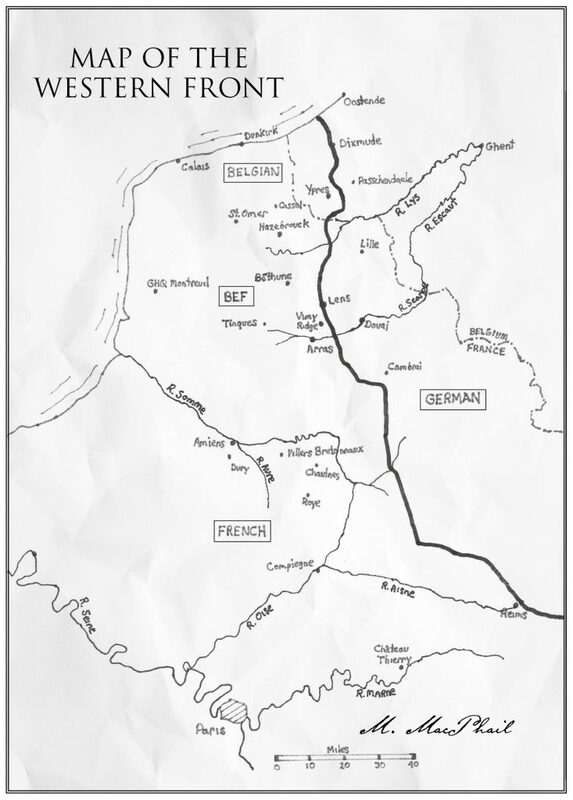 Of the British lines, which began around Ypres and stretched all the way to past Amiens, only the narrow front near Lens and Vimy Ridge, remained unaltered – testament to the formidable defences and reputation of the Canadian Corps. By the end of April 1918 the worst of the danger had passed. In June, an attack in the direction of Paris (a last gasp to approach the French capital) was halted by French and American forces, and this was followed by a successful counterattack. A surprise French-led assault in July, signalled the end of German offensive ambitions on the Western Front. 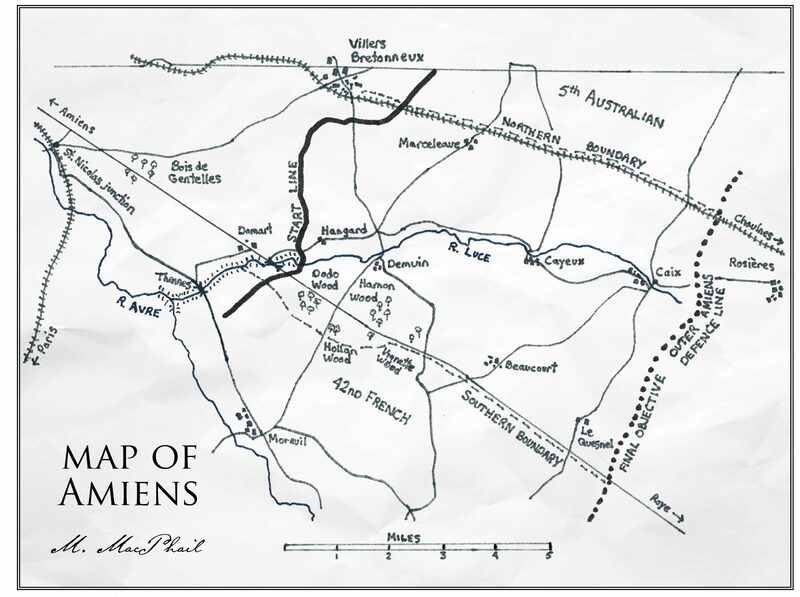 This map shows a close-up of the area of Amiens prior to the attack of August 8th, 1918, focusing on the centre of the attack, which was the responsibility of the Canadian Corps. To the north was the second main thrust, to be carried out by the Australian Corps. North of the Australians, and well off the map, the Imperial III Corps was to advance to protect the flanks, while to the south of the Canadians, the French XXXI Corps, and indeed the French First Army, was to do the same. From the map, an indication of the tactical difficulties can be seen. In particular, the wooded rise known as Dodo Wood (Rifle Wood or Schwartzwald) commands the bridge on the Amiens to Royes road crossing the River Luce. It was across this bridge that Malcolm’s 3rd Division, and others behind it, were to move. With the river and its marshes to the rear, there is only a tiny rectangle of ground before the German lines begin. It is no wonder that Canadian Corps commander Currie and Fourth Army commander Rawlinson fretted about this tiny piece of ground. The main Amiens-Paris rail line, which the attack was in large part designed to free-up, is visible in the far left corner. As with the map above, this map details the centre of the attack at Amiens where the Canadian Corps was employed; the figurative tip of the spear that the Allies thrust into the German lines. There is a particular focus on the ground behind the first day’s astounding gains. In the days following the initial attack the German High Command threw division after division into the fight to stem the tide. Each village, copse of trees, or undulation in the ground became an obstacle to overcome. As can be seen on the right of the map, the first organized system of defence came where the old pre-Somme trenches run across the terrain. Many days of hard fighting where to follow, but within a week the Corps had smashed the divisions brought in as reinforcements and driven through, while the Australians and French pushed ahead on either flank. Stiffening resistance soon convinced Field-Marshal Haig to call off the offensive. But the German lines had been convincingly broken. 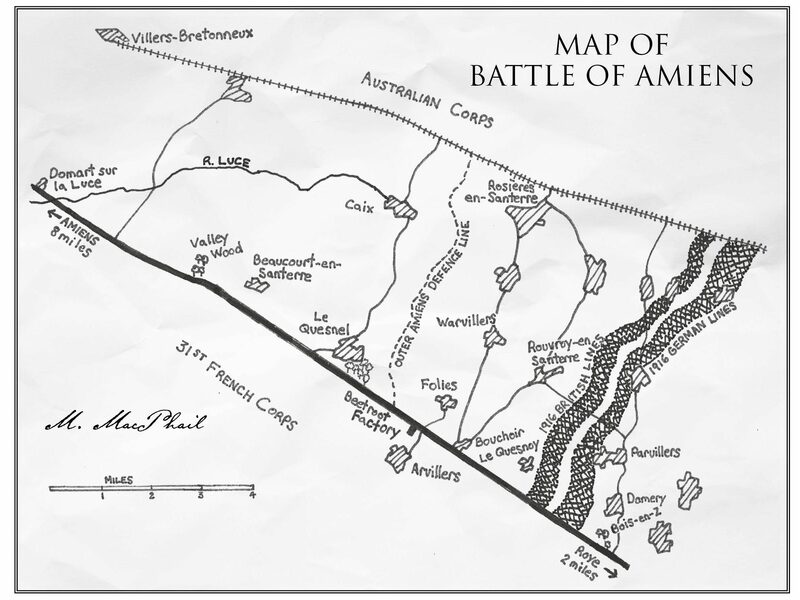 The Battle of Amiens was to prove the beginning of the end for the German Army. East of Arras occurred not one, but two battles in August and September of 1918. The first, known as the second Battle of Arras, or Battle of the Scarpe 1918, began on August 26th and ran for four fiercely-fought days. The Scarpe River can be seen running along the top of the map providing a natural northern boundary. 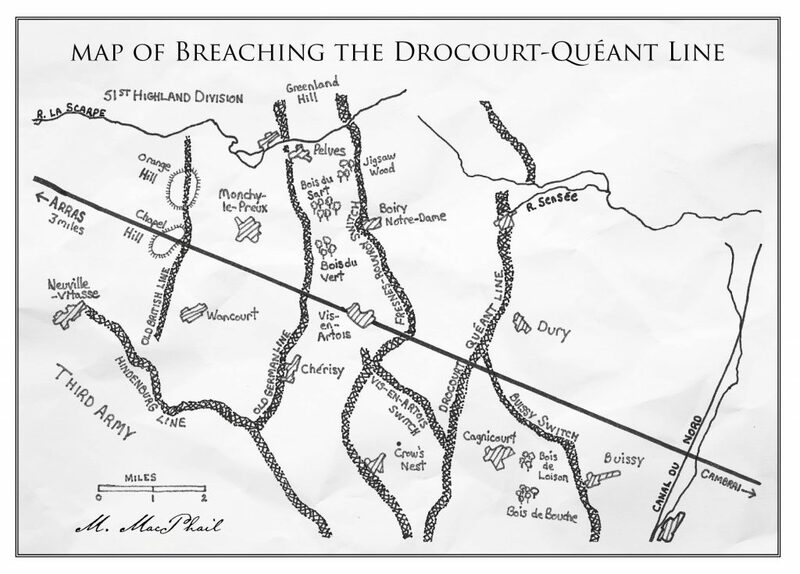 The second battle was for the feared Drocourt-Quéant Line and began on September 2nd. The D-Q Line formed the so-called hinge of the Hindenburg Line, where two major defensive systems came together. 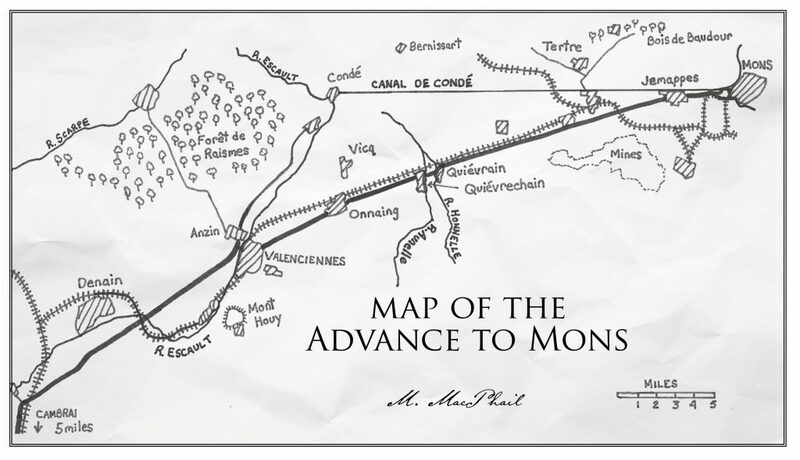 On the map are illustrated the major trench systems (each consisting of multiple lines of wire, trenches, machine-gun nests and other obstacles) which were packed into a ten-mile deep swath astride the Arras-Cambrai road, making it the strongest German position on the Western Front. With no small degree of apprehension did Allied High Command follow the attacks here. By September 2nd, the Canadian Corps had battled through these defences and smashed the “impregnable” D-Q Line. As one battalion history was to describe it, it was a “red letter day in the history of the British Army”. German forces immediately began a withdrawal on a massive front to the north and the south. The victory at the Drocourt-Quéant Line had been a significant one. 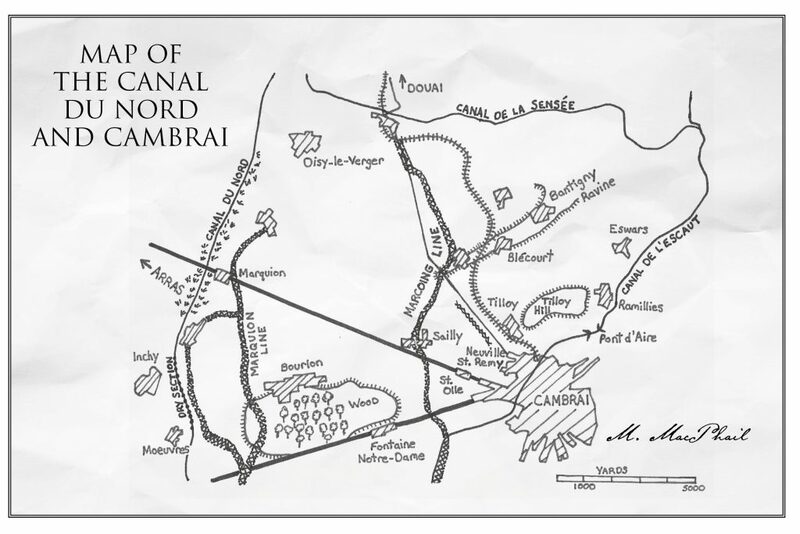 However, as can be readily seen on this map, the path forward was blocked by the Canal du Nord which the Canadian Corps would tackle on September 27th. With marshes to both sides on the northern half, and two trench lines behind it to the south, it was formidable barrier. Overlooking the canal lay the heights of Oisy-le-Verger, fortified with concrete bunkers and a proliferation of machine-gun nests. South of the Arras-Cambrai road the land was dominated by the Bois de Bourlon, the scene of heavy fighting in the 1917 Battle of Cambrai. Several miles further east of these landmarks, and close to the city, was the last prepared defence line: the Marcoing. From there the land rises somewhat to the plateau north of the city, where every road, railway line, village and ravine would be the scene of fierce fighting in late September and early October. Note in particular the Bantigny ravine which cuts through the middle of the plateau, the village of Blécourt in its centre. German battalion after German battalion entered the battle there. From hidden positions machine gunners then raked the shallow slopes of the plateau to either side. This area would see some of the heaviest fighting of the war. 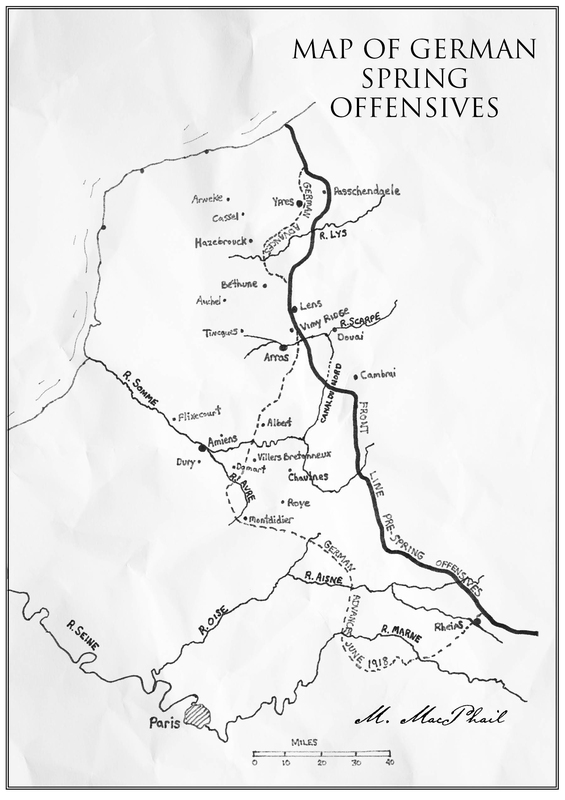 Finally, a mile or two further eastwards, is the Canal de l’Escaut, the crossing of which was vital to enable an encirclement of the city from the north. One of the first things you notice about this map is the scale. It is much larger than any other with the exception of those of the entire front. Following the battle of Cambrai and the capture of the city on October 9th, the Canadian Corps was given a much-needed period to rest and refit. 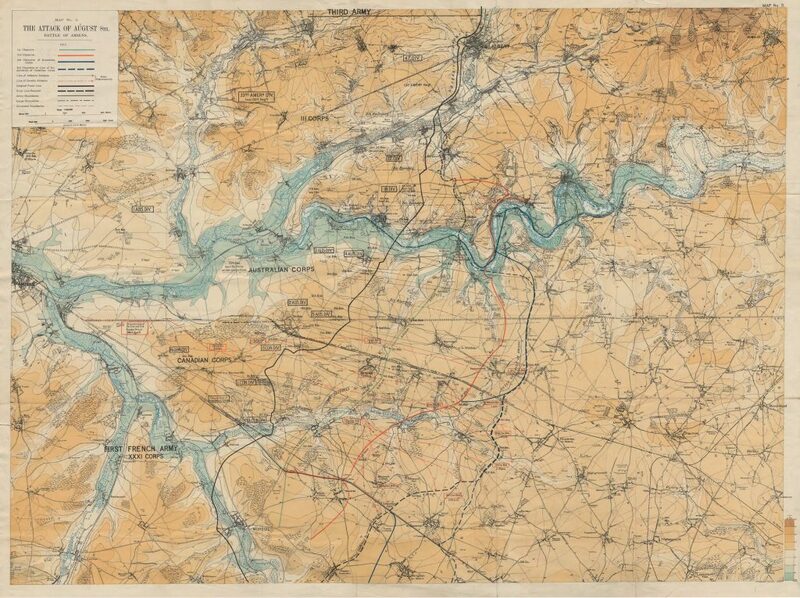 But by mid-October it was in action again in the direction of Douai, well off the upper left-hand corner of the map. With Douai liberated and the Scarpe crossed, the great advance began. For the first time since the retreats of 1914, Allied Armies moved with speed. The Canadian Corps advanced miles daily during late October, liberating in one day alone 40 villages to the left of Denain. Valenciennes posed the next serious obstacle, bounded as it was by forest to the north, and flooded plains to the north and west. At Mont Houy, whose heights held the key to the city, its fate was decided. After a spectacular bombardment on November 1st the hill and the city were taken. Swinging north of the city is the Escaut, where Malcolm’s 3rd Division crossed the canal and made for the villages of Vicq and Quiévrechain. The latter was the scene of a small but crucial encounter to secure the bridges there before entering into Belgium. Pushing through the mining territory west of Mons, the Corps arrived at the city and liberated it in the early morning of November 11th, only hours before the Armistice. In the fall of 1917 the Canadian Corps numbered some 100,000 men. Its structure mirrored that of a traditional British Army corps although it was unique (aside from the Australian Corps for whom this was generally also true) in that its divisions were permanently attached – British divisions moved from corps to corps as the situation demanded. The advantages this permanent structure conveyed in terms of familiarity, common operating practices and general “esprit de corps” no doubt explain much of its success. Four Divisions, each with 3 infantry brigades of 4 battalions comprised the core of its fighting power. As the German Spring Offensives of 1918 tore into British lines the Corps, deeply entrenched and determined to hold its long 20 mile sector near Vimy Ridge, was passed over – the sole section of the 100 mile British line not to be attacked. As summer came its numbers grew with reinforcements and two prescient and courageous decisions. The first was to ignore the British example to reduce each brigade by a quarter, from four battalions to three. Perhaps even more important was its commander’s insistence (despite what surely would have meant a promotion to general) to resist the pressure to field a second corps, and therefore an army (two to three corps is an army). In its stead a nascent 5th Division was used to reinforce and bolster the existing corps. As a result the size and hitting power of the Corps was unparalleled (extra large divisions, 2 additional brigades of field guns, far greater numbers of machine guns and engineering troops, and a reservoir of trained reinforcements). By August of 1918 the Canadian Corps was indisputably the largest and most powerful single force at Field-Marshal Haig’s command. While he may have cursed the intransigence of the colonials at the time, one suspects he was later rather grateful as the Allies strove to break the back of the German Army on the Western Front, the Canadian Corps in the van.